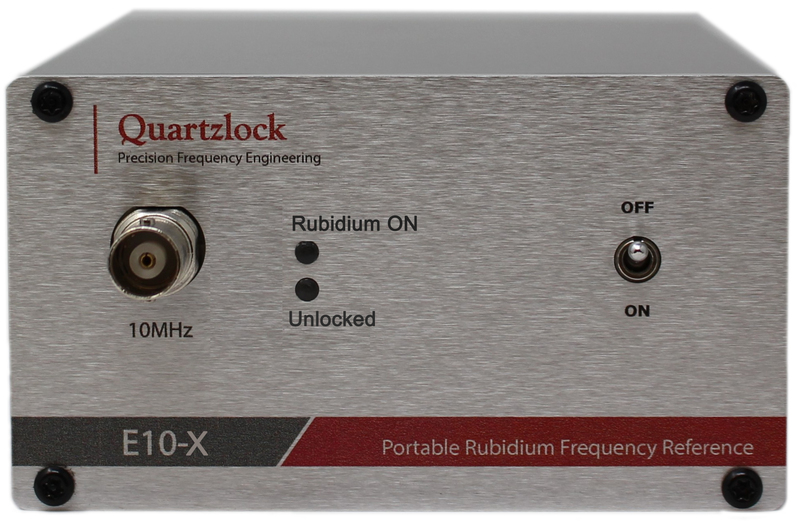 The Quartzlock E10-X Desktop Rubidium Frequency Reference, is a miniature Atomic Clock with 10MHz sine-wave 50 Ohm output. Operating from an external 12Vdc, this miniature enclosure, only 103 x 55 x 122mm has all the performance needed for on-site calibrations, referencing and portable transfer standard applications. Quartzlock's SMAC (sub miniature atomic clock) technology far outperforms chip scale atomic clock devices with poor AVAR & phase noise. The E10-X benefits from simple operation just connect output BNC connector to device under reference. The E10-X is hand held, with <500g mass, and is one of the smallest & lightest atomic clocks with -95dBc/Hz Phase Noise and 8 x 10-12/100s Stability. (100 x better than any OCXO). The power consumption is 6W at 12V dc / 500mA after 3min warm time. No antenna is required or view of sky as the E10-X is a completely independent atomic reference. Applications include: remote site cellular BTS transmitter and satellite communications ground station frequency referencing for calibration. Field service, low noise (remote from supply line hum & noise) development and short production test use. Noise elimination in referencing for signal sources, spectrum analysers, network analysers, subject to lab noise problems.